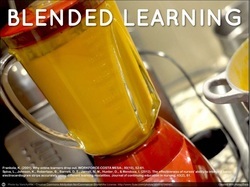 What is Blended Learning Action Research? Within the scope of this project, blended learning is defined as instructor led learning combined with self paced, interactive, web based eLearning. Pamela Lomax, an action research authority, explains it as, "... a way of defining and implementing relevant professional development. It is able to harness forms of collaboration and participation that are part of our professional rhetoric but are rarely effective in practice ... [it] ... starts small with a single committed person focusing on his/her practice. It gains momentum through the involvement of others as collaborators. It spreads as individuals reflect on the nature of their participation, and the principle of shared ownership of practice is established. It can result in the formation of a self-critical community: extended professionals in the best sense of the term." (Lomax, 1991:10). This website represents a documentation of my action research of introducing a blended learning approach in a corporate training environment. Lomax, P. (1991) 'An action research approach to developing staff in schools' in P. Lomax (Ed.) Managing Staff Development in Schools, Clevedon: Multi-Lingual Matters, 2-7.